What do you do with a giant bag of Hash Brown Potatoes? Why you make a Hash Brown Casserole of course! But don’t most casserole recipes usually ask for a can of Cream of Chicken or Cream of Mushroom Soup? 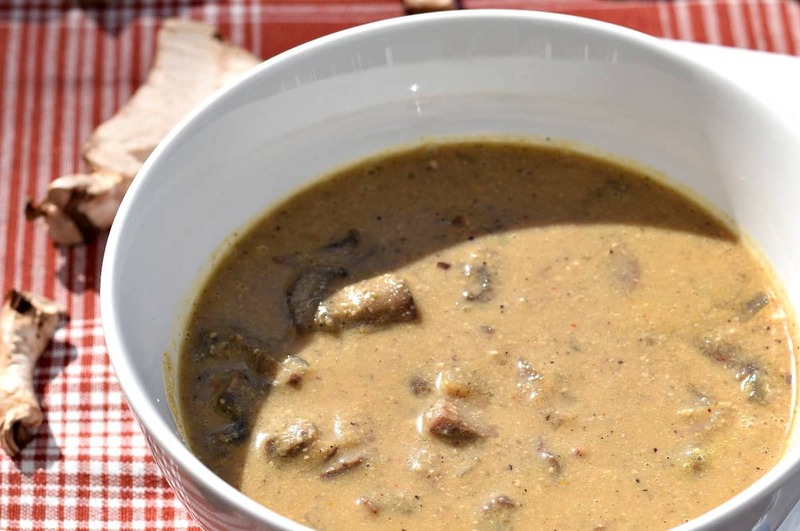 This Vegan Cream of Mushroom Soup is guaranteed better than anything you can by in a can – simply because it’s made from real ingredients, with none of the chemicals or preservatives usually found in commercial soups, and with just a tiny fraction of the sodium! And because there’s actually no ‘cream’ or ‘milk’ in this recipe – it’s completely Dairy Free and Vegan to boot. A one pot recipe that could easily be made in a slow cooker – this one will be sure to please, either as a hearty soup or as an addition to any of your favorite casserole recipes. Give yourself some time to soak the cashews – at least 4 hrs to soften them up. The longer the better. Otherwise they can be a little gritty when you blend them. Saute about ½ sweet onion and a few cloves of minced garlic in a few tablespoons of broth until softened. For the mushrooms, I used two 8oz packages of Baby Bellas as they have a bit more flavor than plain white button. Rinse them really well and slice them up before adding them to your pot. Once they start to release their own liquid, add ½ cup of your favorite white wine, any flavor will do. People have often asked me what can be substituted for wine in my recipes. You can always add additional broth, or water – but the flavor of the wine really makes this dish sing, and all of the alcohol will be evaporated out – so no worries there. If you don’t want to buy an entire bottle, they sell those cute little individual carafe’s at many grocery stores. See if you can buy just one. Let the mushrooms cook until almost all the liquid has evaporated, then add the vegetable broth and seasonings. I would use ½ tsp of dried Thyme if you can find it – rather than ground. If all you have is ground, reduce the amount to ¼ tsp. While that’s simmering – drain your cashews really well and add them to a high-speed blender or food processor. Add the milk and additional cream ingredients (we’re kind of making a sour cream) and blend on high speed until very smooth. Now add a cup of the simmering soup (mushrooms and all) and blend it all together until it’s very smooth. Stir this mixture back into the soup and add salt and/or pepper to taste. Finally, whisk up the corn starch with a little bit of the soup to make a slurry, and then stir this into the soup to thicken it. Homemade Vegan Cream of Mushroom Soup. Ready to be devoured as is or to add to any of your favorite recipes. 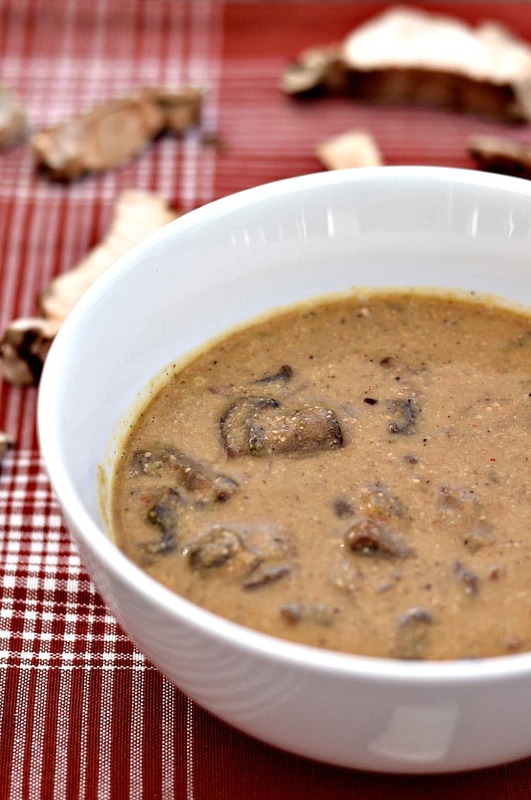 This Vegan Cream of Mushroom Soup is better than anything you can by in a can - simply because it's made from real ingredients, with a fraction of the sodium! Perfect for casserole recipes! This is a great recipe! I made it a couple weeks ago to use in my vegan pot pie, it turned out perfect! I’m going to make it again tomorrow! Thank you! This has become our very most favorite vegan soup!! Just made this, and my husband who is not fond of mushrooms until recently, Loved it!!!! I love your site and the work you put into your recipes. You have become my go-to for a vegan recipe when I need one. Thank for all your hard work. Can’t wait to try this. I cook a lot, and often take a recipe and use it as a baseline, Yours I usually follow to a “T”. How long do you simmer the soup? There’s no mention.